Florence is one of the cities of silver. Here, from immemorial time, the artisans are hammering, enameling, embossing and engraving this noble metal to create wonderful bas-reliefs inspired by nature or geometric patterns. In '300 the presence of the goldsmiths in Florence is evidenced by the Statutes of Art of Por Santa Maria, or Art of the Silk, because jewelry, belts, straps and buttons were considered closely related to clothing. In the sixteenth century Benvenuto Cellini in his book "The Jewellery" describes some of the most important goldsmith techniques in use in Florence. 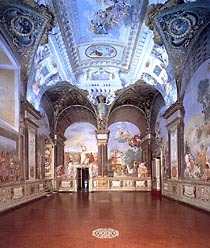 With the reign of Francesco I de 'Medici, in 1572, were born the laboratories of Grand Duke in the Casino di San Marco and subsequently were transferred to the Uffizi Gallery. Since the end of the 500 it was decided to concentrate the workers of art in one area of the city well-controlled and limited. Artists and craftsmen were established on the Ponte Vecchio, in the spaces first destinated for the butchers' shops. With the advent of the Baroque, the style is enriched by new models that can be seen in the Medici Treasury in the Museo degli Argenti.